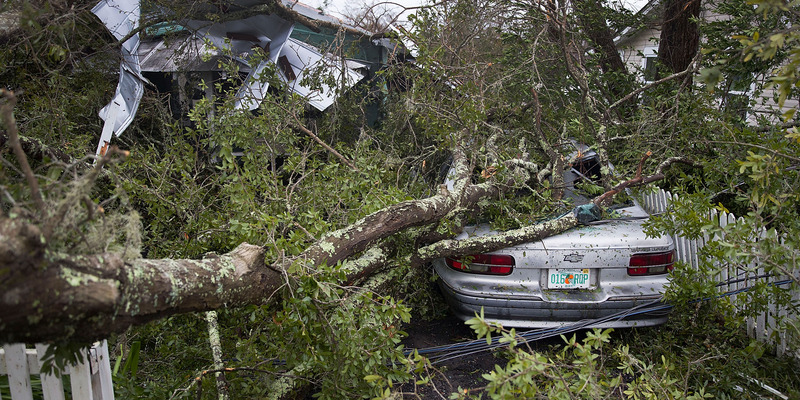 Joe Raedle/Getty ImagesA tree lays on a home and car after hurricane Michael passed through the area on October 10, 2018 in Panama City, Florida. 1. Hurricane Michael weakened to a Category 1 storm leaving at least one dead and hundreds of thousands without power. It made landfall in Floridaas the strongest hurricane to hit the US in nearly 50 yearsand the third-strongest ever. 2. A new poll finds the UK public increasingly want a soft Brexit. Supporters of this form of Brexit say it is the best way of preserving the contested Irish border and ensuring frictionless trade with Europe. 3. China allows for massive re-education camps for Muslim minorities after denying the camps exist. Regional authorities in China revised a local law to encourage the existence of “re-education centres” for its persecuted Uighur ethnic minority. 4. Facebook, Amazon, Apple, Netflix, and Google lost a collective $US172 billion in value. The stock market decline on Wednesday hit the biggest tech stocks particularly hard. 5. Report indicates the Saudi Crown Prince ordered operation to lure missing journalist Jamal Khashoggi into Saudi Arabia. Intercepted intelligence points to his hand in the plot. 6. Elon Musk denied a report that James Murdoch has been tapped as the next chairman of Tesla. Musk has been forced to vacate the role as part of a settlement with the US Securities and Exchange Commission that is also seeing him pay a $US20 million fine over his abortive effort to take Tesla private. 7. A strong earthquake rocked Indonesia’s popular island of Bali. The country is still reeling from a devastating magnitude-7.5 earthquake and subsequent tsunami on the island of Sulawesi, which killed nearly 2,000 people and displaced thousands. 8. A Google linked executive and a former US politician have dropped out of a project to build a $US500 billion Saudi megacity.Members of the project’s advisory board are distancing themselves from the organisation after the reported murder of a dissident Saudi journalist. 9. US President Donald Trump suggested the world’s climate may actually be “fabulous” despite an ominous UN report warning of looming disaster. Trump has previously called climate change a “hoax,” despite widespread acknowledgment from the scientific community. 10. A man accused of plotting to put a Barbie doll bomb on a flight from Sydney has been sentenced to death in Iraq. The brothers of the man pleaded not guilty to terrorism charges in Australia in May.